Everyone loves a good tangent—that is, if you’re reading a science-fiction novel or listening to a story over happy hour. Cold emails, on the other hand, are one of the worst places to wander away from the main point of the message. You have literally seconds to grab the reader’s attention with a sales email, and you won’t do that with long, convoluted messages. 1. It wants to be sales email and marketing newsletter simultaneously. The email starts with a potentially interesting fact: there’s a difference between disaster recovery and business continuity. Now, it just so happens that understanding this difference is a current “hot topic” in business, so maybe the sender has something to tell me about managing it (although I’m probably not the most qualified lead for them, since we’re still a lean startup). They don’t. The email quickly becomes a marketing promotion that explains “business continuity” with dramatic phrases like “essential to the future” and “statistics don’t lie.” Then we’re told to download an e-book. What happened to that compelling fact the email started out with? Just because someone reads the first line of your email doesn’t mean they’ll finish it if you don’t give them a good reason to. In this case, an interesting idea I’d love to discuss gets waylaid with blatant product promotion. Not only does it leave me feeling confused, I also feel tricked. 2. Multiple “main ideas” are overwhelming. In one email, the sender covers: the relationship between two areas of business, the definition of business continuity, the risk of not having a continuity plan, and why I should download the free e-book. Any given email in a campaign should stick to just one idea or value proposition. If you have more than one idea, that’s when using a multi-touch email campaign comes into play. Alone, each of the above ideas would make a solid email. Thrown at the reader all at once, every one of them loses value, and we’re left wondering what, exactly, the sender is trying to tell us. 3. The information repeats itself. 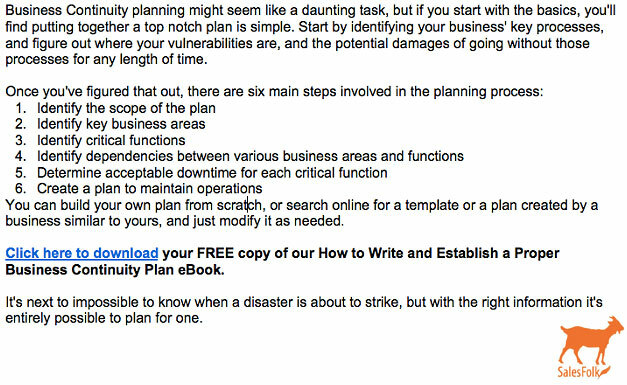 Even riddled with multiple ideas, the email still manages to club us over the head with the same statement: you better plan for disaster, or your company will meet an untimely end. Although disasters do happen, saying it four different ways tends to diminish the effectiveness of the statement. A much stronger way to highlight this fact would be an opening line like, “Did you know that 73% of companies without a business-continuity plan fold when a cyber-disaster strikes?” The number alone would frighten most of us into action, or at least into hitting the “reply” button, but there are plenty of other openers that would work as well. 4. There are multiple calls to action. The sender has a few different requests: download a product, consider having a conversation with them, and to send an email or make a phone call. That’s too much to ask a stranger over one cold email. That doesn’t make the other calls to action, like the e-book download, unusable. This is one of the reasons eight-touch email campaigns are so important. They give you a chance to offer different kinds of call to actions to see what works best. 5. It gives too much away in the follow-up message. The second email gets one fact right: business continuity is a daunting task. But the length and detail in this email don’t make it any less cumbersome. We don’t need to see all six steps of the planning process in a single email. While this may be appropriate in a slide deck during a meeting, none of this belongs in an email to a stranger. Not to mention, providing all six steps and a free ebook removes a lot of the incentive to respond to this email. The moral of the story? Be mindful of how much value you’re giving away over a sales email. Give too little, and recipients will instantly forget your email—if they open it at all. Too much, and they’ll bypass your expertise and get the job done themselves for free.